Let’s talk about why these problems act the way they do. When we go running, through the repeated motion and shock absorption of striking the ground, small microtears begin to occur in our muscles and tendons. This can happen more in certain locations if there are muscle imbalances, or if you’re going harder or longer than your body is used to. For example, running up and down hills is much more challenging than running on flats. So if you haven’t done a lot of hill running, and then suddenly do High Park hill repeats, you’re definitely going to experience more microtears than usual in your muscles and tendons. Now - this is fine! This is totally okay. The body is strong and robust and its job is to heal up those tears. As they heal, the muscle becomes even stronger, which allows you to do even more hill reps the next time. This is one reason why adequate recovery and tissue maintenance (massage, foam rolling) is SO important, as well as sleep, hydration, and nutrition. Where problems tend to occur is when we do too many hard workouts in a short period of time, or increase our distance or paces too quickly. When this happens, the amount of stress and microtearing in the muscles and tendons begins to outweigh how fast it can heal itself up. The microtears begin to get bigger and more numerous, and the tissue that is laid down by the body in urgency becomes haphazard, stiffer, less flexible, and less strong. This “crappy tissue” is what we tend to refer to colloquially as “scar tissue”. It can feel ropey, tight, and weak. It requires more time to warm up, and when it cools down again, it becomes stiff and painful. It can be stiff and sore in the morning, but again tend to improve with movement or warmth like after your morning shower. To treat issues like this, we need to essentially re-strengthen these tissues. This is done with a very specific progressive strengthening program and ALWAYS needs to be assessed properly and in detail by a therapist familiar with tendon-type overuse injuries. These can be finicky and frustrating because if you over-do the amount of exercise or running you do, you’ll experience a setback. (A runner’s least favourite word.) These take patience and skill, but they do go away. Please, please, see someone about these, because despite what you do, they don’t Go Away On Their Own very often. Of course, the best medicine is always prevention. One way to help decrease the likelihood of an overuse injury is to be mindful that you’re not introducing too many new variables into a training program too quickly, and also to maintain a supplementary strength building program as well. Strengthening exercises (like the ones on this week’s Instagram) is a great way to improve the robustness and capacity of the tendons so that when you DO decide to run hill reps, you’re not going to do as much damage to the already-strong tendons and muscles. Check out Physio Leslie in the following video for one of our favourite strengthening exercises - and of course keep an eye on our Instagram account for more. 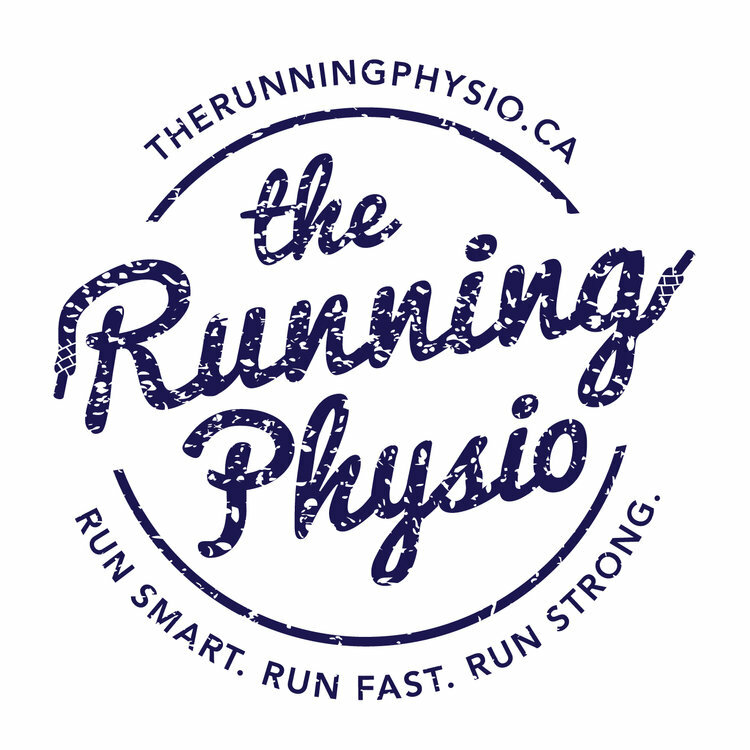 And if you’re looking for a great way to learn about tissue health and running gait, don’t miss our clinic on April 5th with special guest Jacqueline Gareau - Canadian Boston Marathon winner and Olympian as she teaches good running habits and injury prevention techniques. Sign up can be found here. We recommend the following general rule with endurance strengthening exercises: The last three reps of each set should be about 7/10 challenging. Meaning, if you are starting to feel things are getting hard at rep 6, do two more. In general, you’ll want to aim for about 2-3 sets of 8-10, so choose a weight that makes this happen. There’s no need to do these exercises more than 2-3x per week (unless your injured, in which case we recommend chatting with us first so that we can figure out the proper parameters together :) ). Remember - you don’t get strong by running, you’ve got to be strong to run.